Hippo Bag Collection - Cheaper, faster, nationwide. Buy one of our bags or we can collect a Hippo Bag - typically much faster. We offer a completely flexible service man and van collection - which means you can specify your collection day, we'll take the bag from a little further from the road, we can remove most standard waste streams. If you join our Beeloyal scheme you'll also get a 10% Beeloyal account credit on all orders. * We are not connected to or affiliated with Hippo Waste in any way. Join Beeloyal and get 10% credit per order. Your Hippo Bag must be within 10m of the road and it must not be overfilled. We can only accept small amounts of heavy and dense construction waste / soil and must be within 10m of the road. Bag must not be overfilled. Must not contain construction waste or heavy and dense waste. Must be within 10m of the road. Bag must not be overfilled. Need a bag and collection? There is no Hippo Bag of this size. 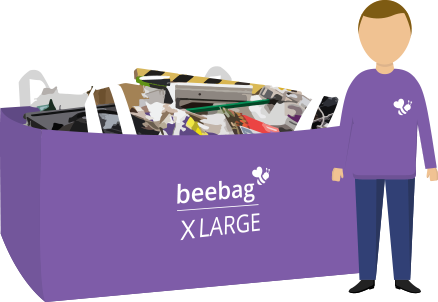 What can fit in a X Large Beebag? The X large skip bag is the same size as 12 washing machines or a builders skip. This bag is only for bulky waste - no construction waste will be accepted. It is perfect for a clearance project. We're happy to leave you with the bag, ready for re-use next time - saving you time and money and helping the environment. 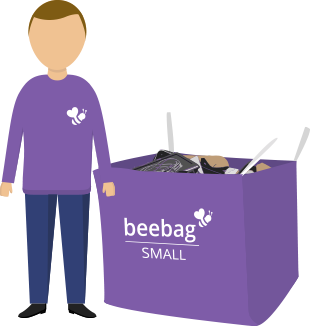 Clearabee is the UK's largest in-house rubbish clearance company. We don't subcontract any of our collections and we complete the majority on a same day basis, so with us you're in safe hands. 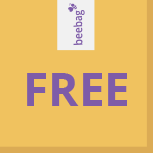 Clearabee offers free next day postage. Hippo charges £2.99 - £4.99 for delivery. Our bags can be ordered up until 1pm for next day delivery. We'll also deliver on weekends. A Hippo Bag must be ordered before midday, and you'll need to pay P&P which varies on bag size. For a surcharge we will collect electrical waste such as fridges and TV's with your bag. These items cannot currently be collected with a standard Hippo Bag. 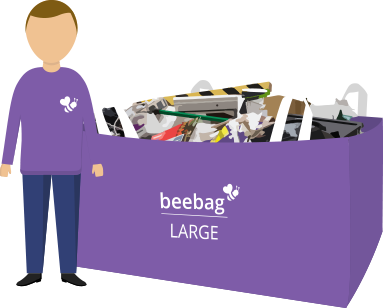 With beebag you can pick your date of collection, with same day availability in most areas. 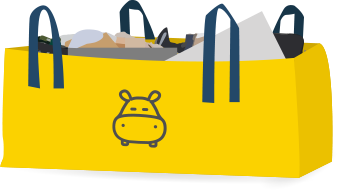 While with a Hippo Bag you have to leave the bag outside and Hippo will aim to collect your bag 'within 5 working days', starting of course from the day after you request a collection (and this time frame is not guaranteed). 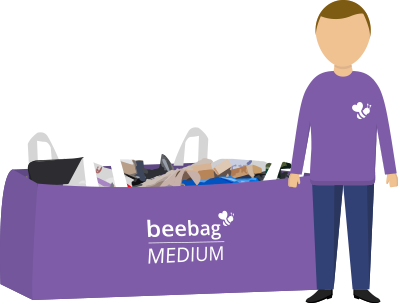 With beebag we can collect your bag even if it isn't directly on the kerb side, or within a few metres. We're happy to remove your bag up to 10m from the road. Hippo Waste state that the bag must be placed near a road with 4m of access for a HGV and within 4m of the road for a crane to collect it. We offer a 10% credit to all eligible online orders for regular and trade customers. This makes our skip bags even cheaper, and we'll also collect Hippo Bags which will count as an eligible purchase, so feel free to use up that old stock! 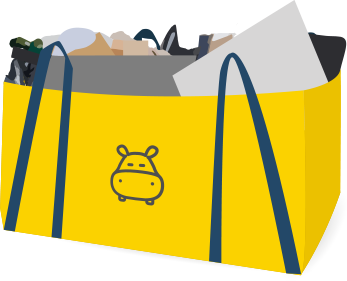 We're happy to leave you with the Hippo Bag or Beebag, meaning you can make an extra saving by booking a collection only price, and of course you'll be helping environment as we won't be sending out brand new bags. 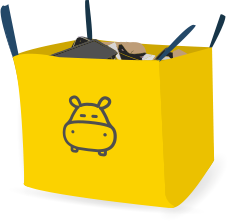 Hippo will always take away the bag, meaning you'll need to buy a brand new one every time you need a collection - bad for the environment, your wallet and not all that convenient.